How many years have I driven past that building on Dewey Boulevard and just taken it for granted ? I always thought of it as a twin or an extension of the Army & Navy Club next door which unfortunately is gone now. I suppose we should be thankful that the government is using this as the Museo Pambata (Children’s Museum). Hopefully it’ll be one of our heritage buildings that we’ll be able to save. I’m referring to the Elks Club right at the corner of San Luis (Kalaw) and Dewey (Roxas). 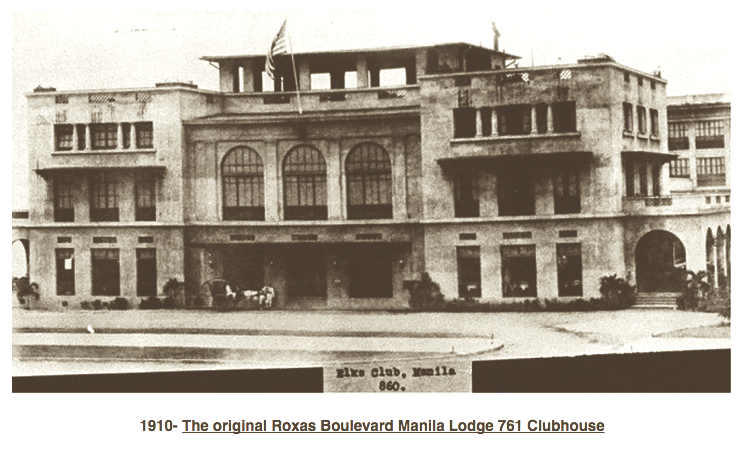 I did some digging around, as I usually do, and came up with a bit of history about the Elks Club in Manila. It was still very early in the American colonial period. 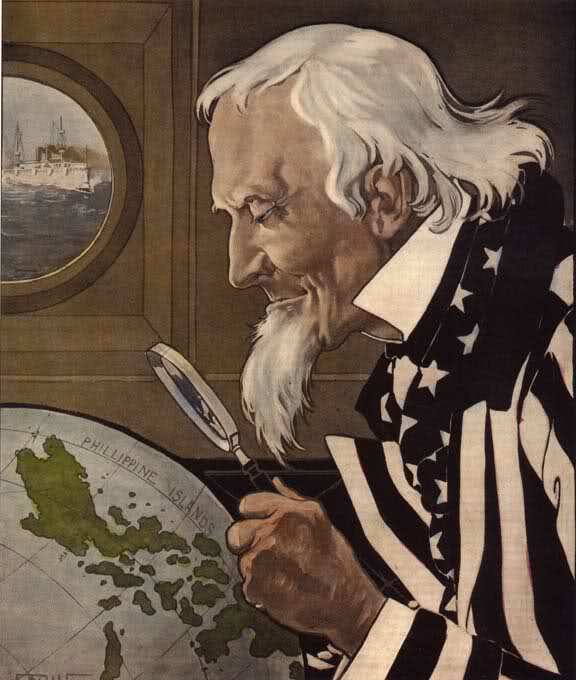 Most of the Americans residing in Manila were made up almost entirely of American soldiers, officers, men of adventurous spirits and those who had accepted appointment to office under the civil administration instituted by Governor Taft. 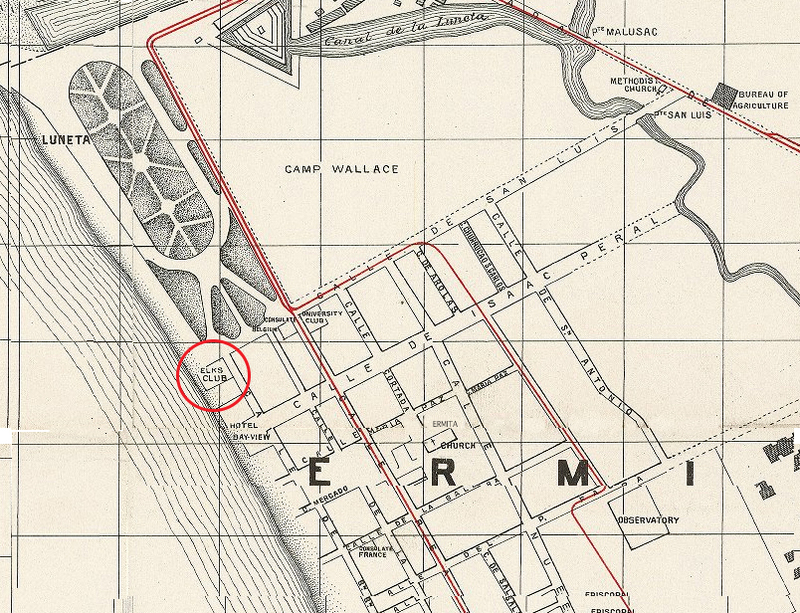 In 1900, Americans had yet to migrate to the “burbs” in Ermita and Malate, preferring the smaller hotels around Intramuros, rooms at the Hotel Oriente in Binondo or the Bay View Hotel facing Manila Bay. The American military were ensconced within the barracks at Ft. Santiago or Malate; the most senior officers resided at the Plaza Militar in Ermita. Towards the end of the Spanish era, Manila’s growth was mainly focused on the north side of the Pasig. 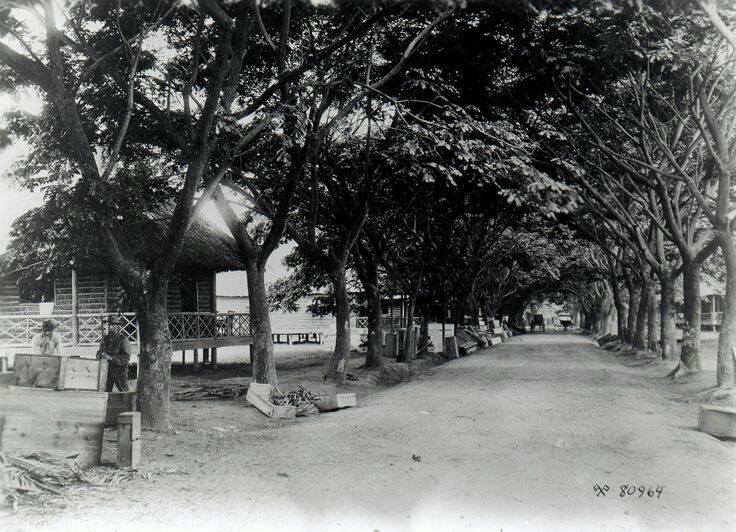 Ermita was essentially unimproved swampland, dotted by nipa huts with a few permanent homes along San Luis, Calle Real and other streets along Cavite Boulevard (Dewey Blvd). 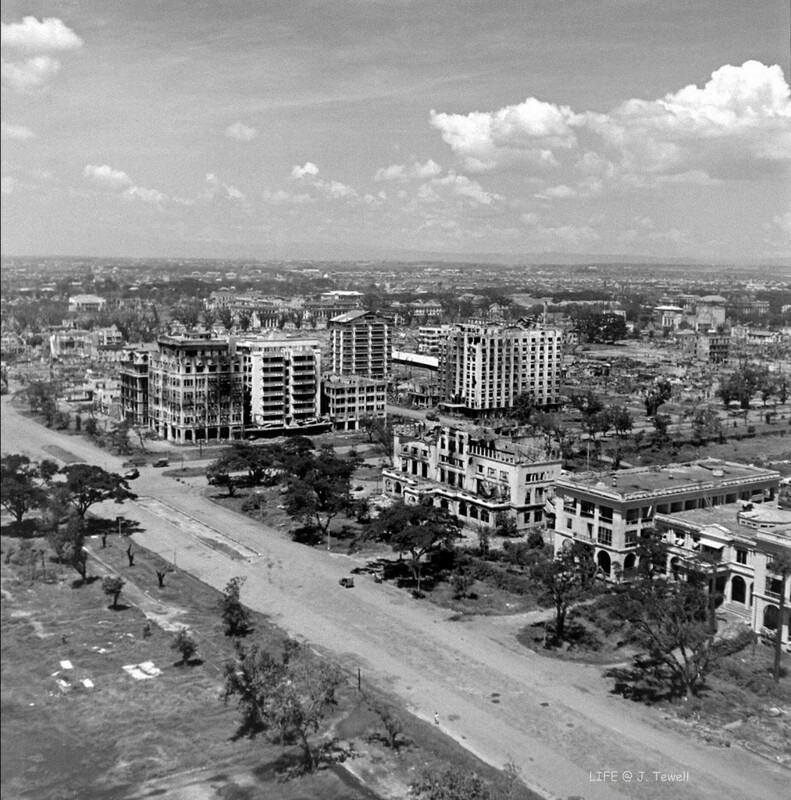 With extraordinary vision, Burnham’s development plan for Manila spurred many projects which prompted the city’s growth southward from the Pasig. 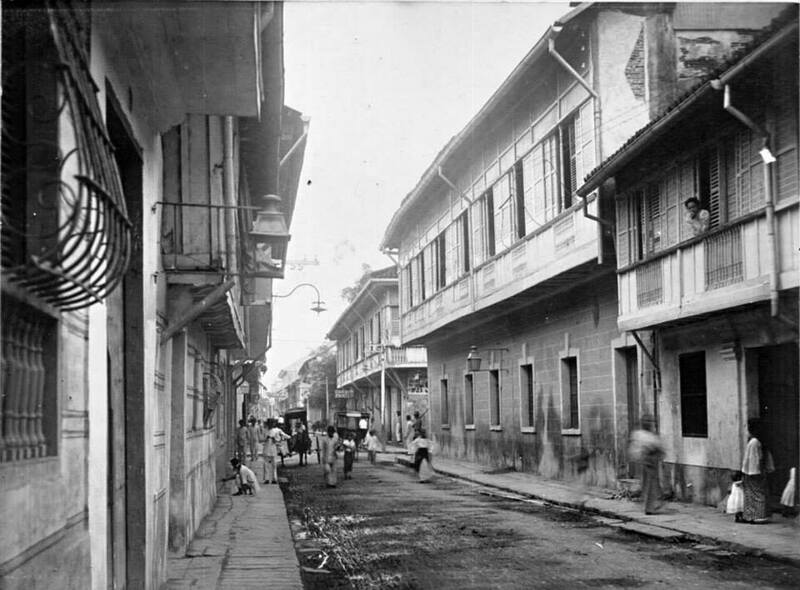 The mosquito infected moats around Intramuros were filled in, streets were now graded and surfaced, Tranvia (street car) routes were extended along Calle Arroceros to Malate, and more homes were built to house the Americans, more to the style of what they enjoyed back on the mainland. Social clubs then played an important role in banding expats together. 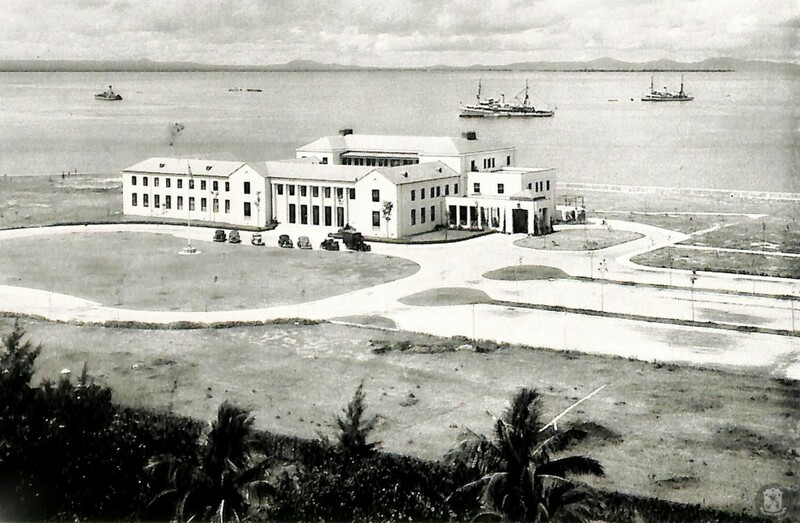 Already established by 1900 were the German Club, Manila Club (British), Filipino Club, and Casino Español to name a few. They catered to nationalistic pride, promoting their customs and familiarity with their former country. Thus it was providential that Henry Musser, the first Elk (from the Leadville, Colorado Lodge) in the Philippines, organized a meeting with seven others which resulted in the organization of the Manila Lodge. On Sunday morning, Sept 21, 1901, the first meeting was held in the office of Capt. C.W. Mead, then City Engineer of Manila. A week later, they held another meeting at which a large number of “would-be” Elks attended, apparently attracted by the entertaining attitude of the seven promoters. From that time on, the movement for a Lodge of Elks in Manila was an assured success. 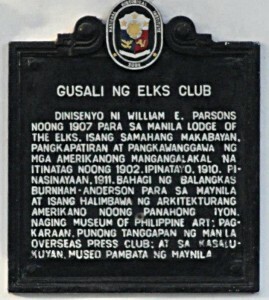 The Benevolent Paternal Order of the Elks’ mission was to cultivate fellowship as a fraternal organization and support the principles of American patriotism, thus forming a bond with the American expats in Manila. Application to the Grand Lodge was made and the 1902 charter was granted to M.L. Stewart and Theo Riser, who became Exalted Ruler (CEO) and Secretary, respectively, on August 14, 1902. The Elks clubhouse was located at 340 Calle Palacio. This is a good view of what Calle Palacio looked like at the time. The clubhouse may have been a few blocks from where this was taken. After 18 months, being quite successful and now needing even more space, the club’s premises were transferred to Calle San Luis, corner Calle San Jose next to the Luneta which had as yet to be expanded by landfill. An entire new building was secured while still in the process of being built. It was one of the rare three-story buildings in this city of earthquakes and typhoons. Below, the building is the tallest one just to the right of the Rizal Monument. The photo below shows the Luneta extension had not as yet been completed in accordance with Burnham’s beautification plan. The Manila Hotel was still ten years away. The February 1904 move was largely financed by the Second Elks’ Amateur Minstrel show, which raised $2000. 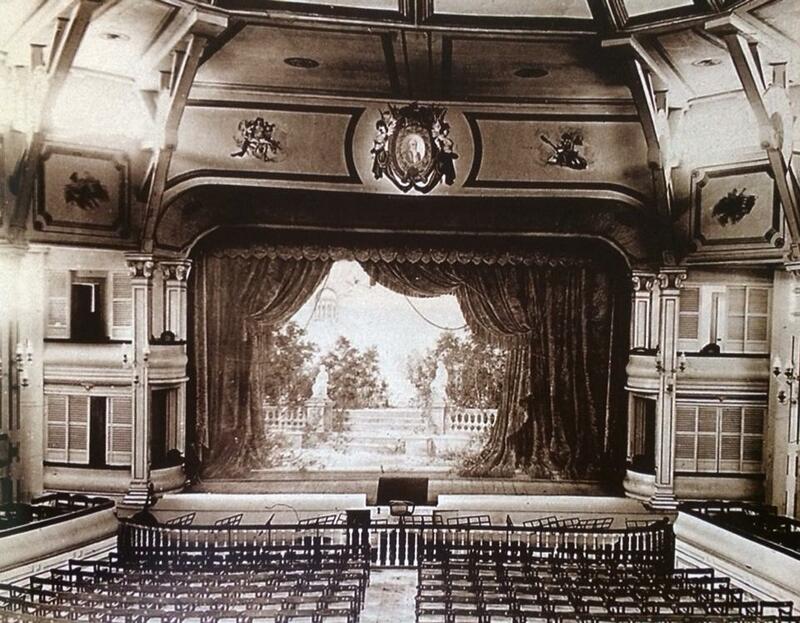 It was a sold out performance; every seat was occupied at the Zorilla Theatre ( Azcarraga corner Evangelista streets), which had been donated by Jack Levy, the number one American showman of the day. The show included talented amateurs from the member ranks. 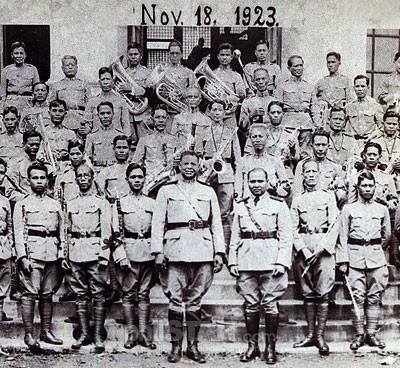 The distinguished black American, Walter Loving (of the Philippine Constabulary Band) contributed a “plantation medley” of his own arrangement. In 1909, the Elks Lodge, with 488 members crowding the facility, now needed much larger quarters. Tom Wolff was manager of the Elks at the time, arriving in Manila in 1898 as a young lad and eventually making his fortune starting Sanitary Steam Laundry. Architect William Parsons was commissioned to design a new building as well as the Army Navy Club building. Contractor R.M. Loper won bids to construct both clubs. He would also construct the Manila Hotel. The new project would cost over $200,000 and was covered from the funds of the members of Manila Lodge. The handsome new Elks’ clubhouse provided its members with a facility comparable to those of the Army-Navy Club. Since the Elks’ Club was usually the center of American patriotic celebrations, the opening of the clubhouse promoted the development of group attitudes and sentiment inside the American community. The expats banded together and for many, racist attitudes dominated social activities. Visiting Secretary of War Dickinson a year earlier had noted publicly: “The most insensate way to bring people to one’s way of thinking is to abuse them. This thought is addressed to Americans and Filipinos alike, not only in respect to government, but … to their relations with one another.” In this telling photo, members of the U.S. Army Signal Corps posed for a portrait with their Filipino servant outside, looking in. July 4th was always a celebration held at the Elks, typically one of the most pretentious affairs found in Manila, attended by the majority of the American community. To assure their enjoyment of the event, American troops assigned to the Manila area were paid as speedily as possible also assuring the local businesses with an anxious group of thirsty clientele.This photo shows the clubhouse completely lit up, seemingly on fire standing out from the blackness of Manila Bay beyond it. On the roof waved an American flag, the fluttering of colors being duplicated by winking electric bulbs. The Elks and Army Navy Clubs early 1930s. The following three photos were taken inside the Elks Club on July 4, 1937. It’s clear the Elks members knew how to party. (photos courtesy of the American Historical Collection with the help of Bob Blume) J.P. Heilbronn can be seen at the front table. His generous donation funded Heilbronn Hall at the American School in Pasay. An article in the American Chamber of Commerce Journal in October 1921 reported that the Lodge had a membership of 600 Americans as compared with the Manila Polo Club which had about 425 at the time. By 1925, the Elks Club had increased its footprint by building service apartments at the rear of its major building, between the Elks and the Army and Navy Club. The extension is clearly visible in the photo below. These facilities provided for almost 100 service type apartments for both businessmen and women. 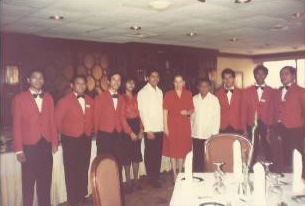 The Elks Club became a hub to network and form business contacts and was considered the gateway to business success in the Philippines. In retrospect, the Elks Club served as the forerunner of the American Chamber of Commerce. 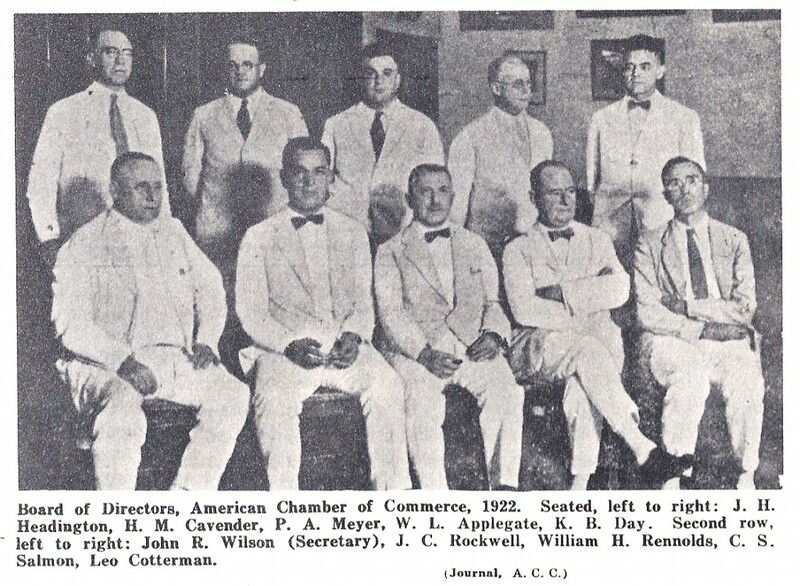 The Chamber, formally established in 1920, was temporarily housed at the Elks Club. 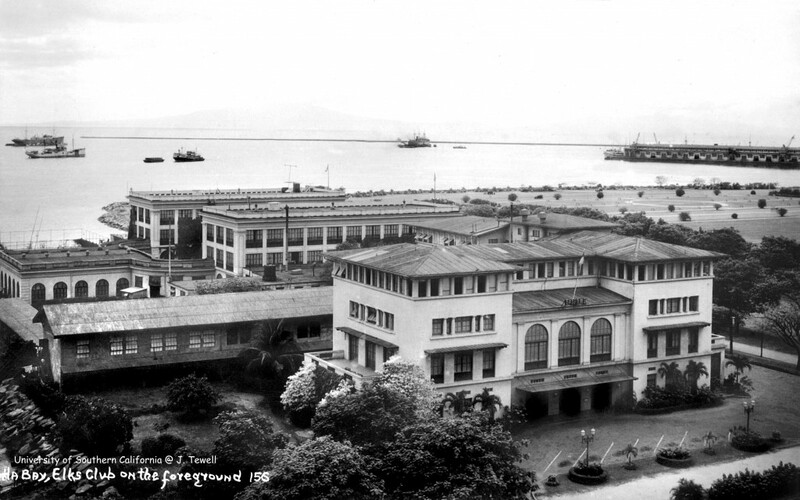 When President Quezon moved into Malacañang Palace after the formation of the Commonwealth in 1935, the U.S. Commissioner’s office moved to a wing of the Elks Club and remained there until 1940 when the new High Commissioner’s residence (now U.S. Embassy) was built next door. As early as January 1941, concerned Americans decided to call a public meeting at the Manila Elks Club to review options in the event of a Japanese attack. Three hundred people were present to elect officers of the new committee to coordinate with the U.S. Army, Navy and the High Commissioner’s office as well the the Philippine Commonwealth in case of an emergency. The committee met once a week to attempt to arrive at solutions involving preparedness, civil defense and national defense. 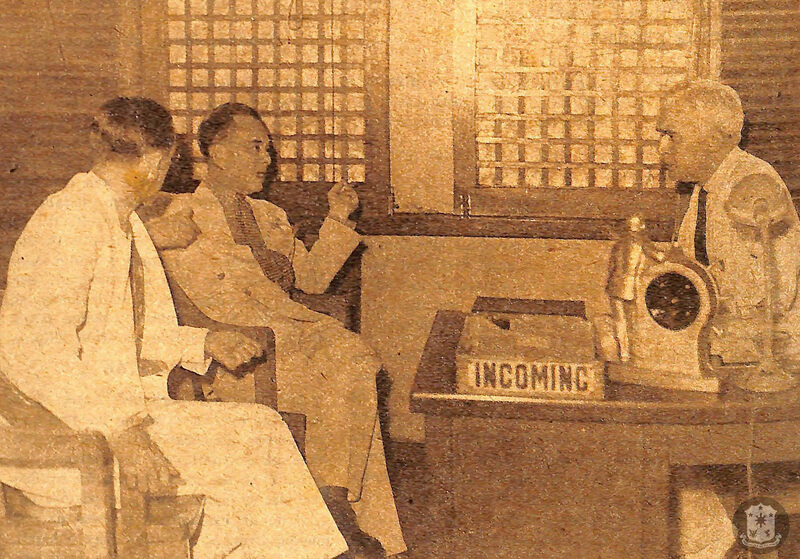 Plans were drawn up for air raid shelter constructions, designated evacuation centers in the event of Manila bombings and advised residents to stock up on food, clothing, and medicine. The Red Cross even provided housing, sanitation and water facilities for an evacuation center sixty miles from Manila in Pagsanjan, Laguna. 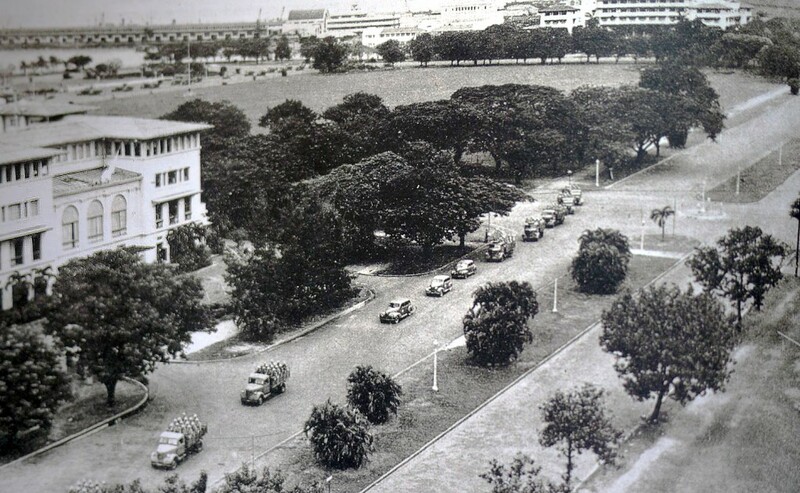 During the Japanese occupation in 1942, the invading Japanese forces spared the Elks Club, Army Navy Club, Manila Hotel and Wack Wack Country Golf Club from destructive bombing, aiming to use these as Japanese military offices. 117 Elk members were interned at the Santo Tomas internment camp during the occupation. 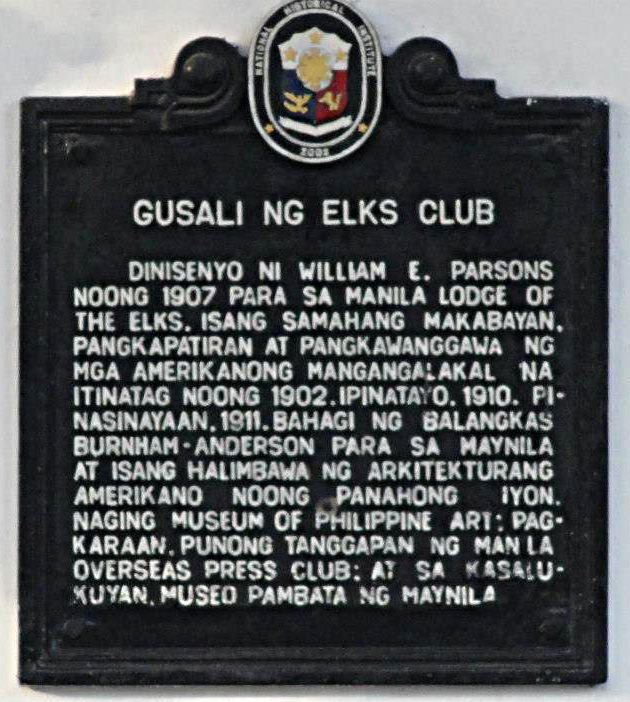 To this day, the Manila Lodge 761 is the only Club in the history of the Elks organization, where a foreign flag was flown on its premises. Three years later, the Battle of Manila resulted in almost total destruction of Manila; complete devastation was evident especially south of the Pasig. The Elks Club suffered the same fate. The Club which throughout its life had existed in large part in order to promote patriotic U.S. sentiment, needed new goals in an independent Philippines. Starting in the mid-Fifties, there was a gradual migration from Manila’s older neighborhoods to the more affluent Makati suburbs leaving clubs like the Elks and the Army Navy now inconveniently located. Nonetheless, the Elks continued their traditional functions, including the annual July 5 Stag Party and Flag Day celebrations, and their charitable activities, such as Santa Claus gift visits to the city’s orphanages. From its prewar peak of 700 members, the club now numbered around 150. 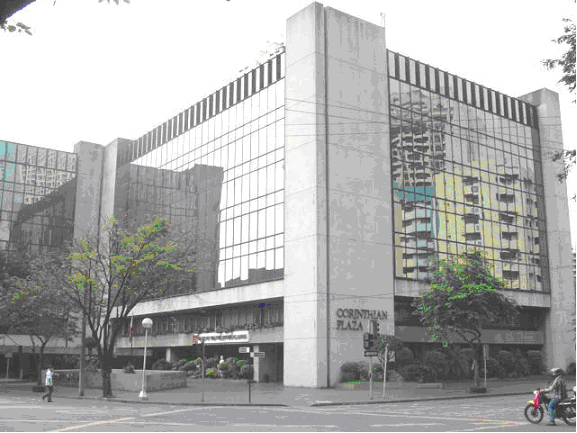 As a consequence of the expiration of the the Laurel-Langley Act in 1976 which resulted in foreigners being prohibited from owning property, The Elks Club on Roxas Boulevard was sold and the lodge was moved temporarily to another facility in the Flag Village of Makati. In 1977, the Flag Village property was sold and the Lodge acquired the 7th floor of the Corinthian Plaza building where the club remains today. 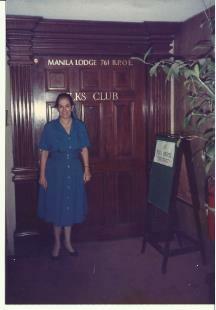 Miren Galloway, member of our Facebook Manila Nostalgia group shares these photos of her mother, Lorea Galloway who was manager of the Elks Club, Makati until 1990. As always, I welcome your comments, stories and photos. I remember my mother bowling in the upper floors of the building in the back of the main Club. Christmas & holidays, I was taken to the main building to watch cartoons & see Santa Claus. 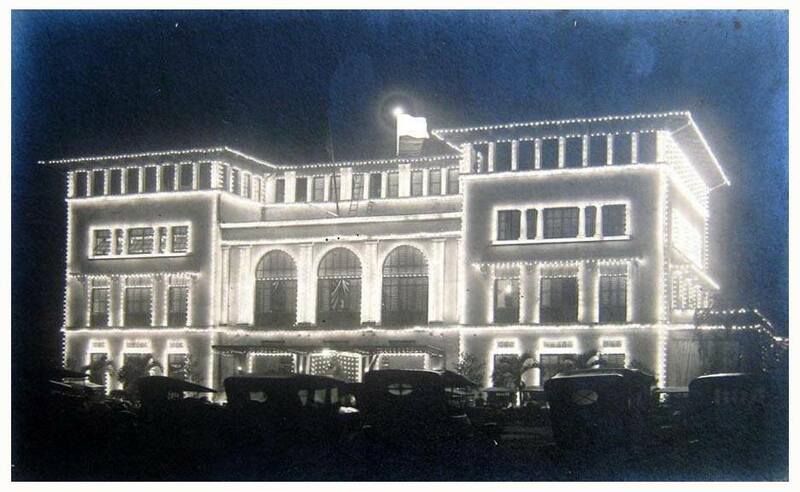 That place was old with very high ceilings & had the same ambiance as my grandparents home in Lingayen, Pangasinan…. All the years we went to the Army Navy Club, we knew about the Elks Club next door, not thinking anything of it. Now I know all about it thanks to you Lou. Thank you for this article. 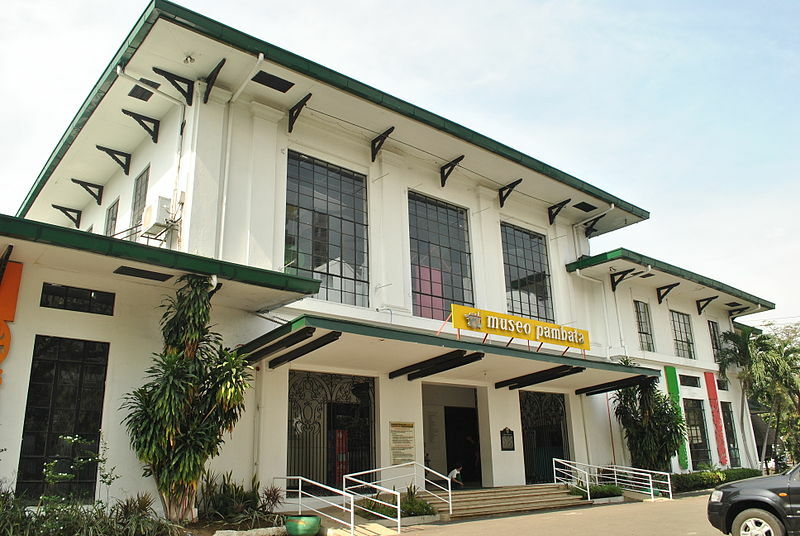 I now work at Museo Pambata, the children’s museum and it is such a joy to know the history of this building. I am sharing this on Facebook. 🙂 All the best! 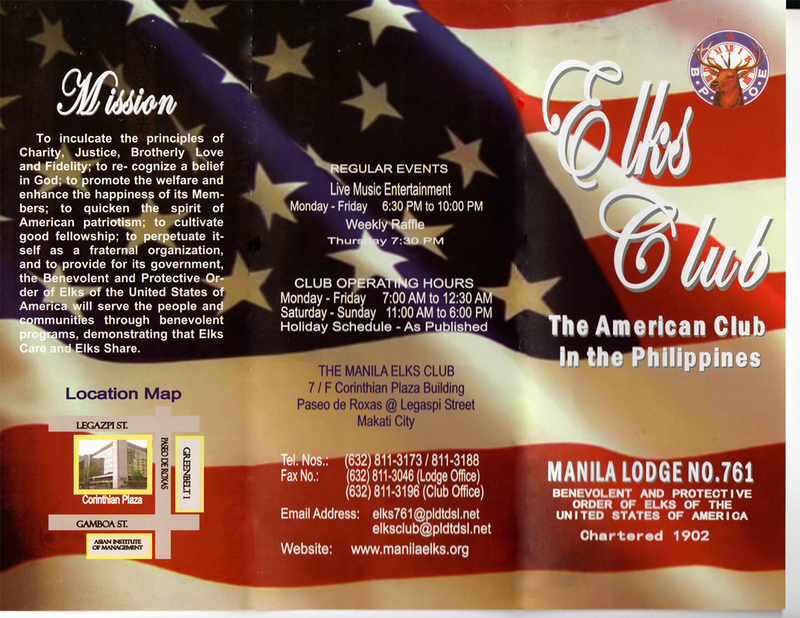 is elks club still present in Manila?